In an important milestone for the Thirty Meter Telescope (TMT) project, Japan, one of the project's five international partners, has indicated its strong national backing for the next-generation astronomical observatory. On Wednesday, May 15, the Japanese parliament, known as the Diet, passed a fiscal year 2013 budget that includes key funding provisions 1244 million yen (approximately $12.2 million U.S.) for TMT, which contains TMT preparatory budget and a portion of Japan's TMT construction budget. "We welcome the support of the Japanese government as demonstrated in the 2013 annual budget," said Masahiko Hayashi, the Director General of the National Astronomical Observatory of Japan (NAOJ), a collaborator on the TMT project. "With these funds, the TMT project will make important strides this fiscal year toward one day becoming the most advanced and powerful optical telescope on Earth." This latest round of funding follows a fiscal year 2012 supplementary budget passed back in February for TMT. Those funds were designated for producing mirror blanks as well as development and verification of the technology and the detailed design of the telescope system. TMT is a segmented mirror telescope consisting of 492 mirrors that combine to form the 30 meter primary mirror. Multiple countries will contribute to the construction of the 492 segmented mirrors. For its share of the contribution, Japan is expected to manufacture the main telescope structure and the mirror blanks for the segmented primary mirror, as well as provide a portion of the polishing of the segmented mirrors and instrumentation. In total, Japan is expected to contribute a combined total equivalent of one-fourth of the total cost of TMT construction. Along with the recent funding allotments, TMT has been newly added to the list of major projects promoted by Japan's Ministry of Education, Culture, Sports, Science and Technology (MEXT) through its Promotion of Large Scientific Research Projects. Other large-scale projects in this special budget category include the Super-Kamiokande neutrino observatory in Japan, the Atacama Large Millimeter/submillimeter Array (ALMA) in Chile, and the Subaru Telescope, which like TMT is also in Hawaii. Japan passes budgets one fiscal year at a time, so the remaining expected funds for TMT development and construction have not as yet been allocated. But with the inclusion of the requested funds in the fiscal year 2013 and February's supplementary budget, MEXT has offered strong signs of its commitment to the overall project for the future. "We expect that the devoted work by scientists in our country will lead toward important outcomes for international science projects," said Kazuhiro Sawakawa, Director of the Scientific Research Institutes Division of MEXT. "In order to have great success with the TMT project, financial contributions from partner countries are indispensable." "The Japanese government's endorsement of the TMT project is an important step in the construction of TMT, providing the necessary funding for key elements of the telescope,” said Edward Stone, the Morrisroe Professor of Physics at the California Institute of Technology (Caltech) and vice chair of the TMT board. TMT is the next-generation astronomical observatory that is scheduled to begin scientific operations in 2022 on Mauna Kea, Hawaii. 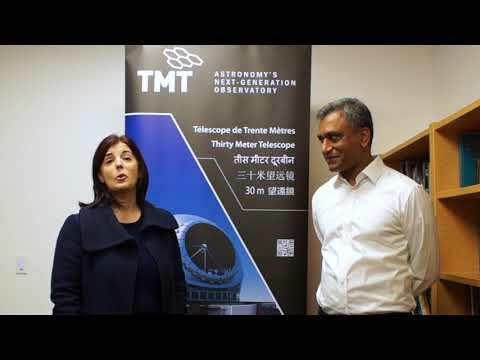 TMT is a collaboration of the California Institute of Technology, University of California, the Association of Canadian Universities for Research in Astronomy, the National Astronomical Observatory of Japan, a consortium of Chinese institutions led by the National Astronomical Observatories of the Chinese Academy of Sciences, and institutions in India supported by the Department of Science and Technology of India. Major funding has been provided by the Gordon & Betty Moore Foundation.